(BGF) – Jim Gomez, reporting for The Associated Press, recently wrote of U.S. Admiral Samuel Locklear’s warning that a miscalculation in the dispute between China and Vietnam could trigger a larger conflict. According to Gomez, Adm. Locklear “urged both nations to exercise restraint” and to develop a legally binding code of conduct that would prevent territorial disputes from escalating into conflicts that would harm the region’s growing economies. Click here to read the full article or visit The Associated Press‘ website. 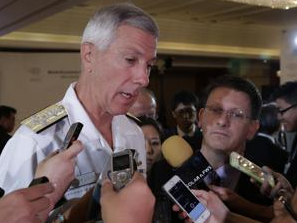 MANILA, Philippines (AP) — The U.S. military commander in the Pacific warned Friday that the risk of a miscalculation that could trigger a wider conflict in a tense territorial standoff between China and Vietnam is high and urged both nations to exercise restraint. Vietnamese Prime Minister Nguyen Tan Dung, who also attended an economic forum in Manila, told The Associated Press in written comments Thursday that “like all countries, Vietnam is considering various defense options, including legal actions in accordance with the international law.” But he said Vietnam would defend itself if it comes under attack.